When using public transport, we often need to transfer to a different route during of the journey. These transfers have costs – I can think of the following, but there may be more. If we're reading, working, etc. on board, we need to stop, losing flow. We spend time moving from one route to the next. We spend time waiting for the next departure. There are lots of passengers moving between routes. They take up space and cause queues when on- and off-boarding. This also increases the risk of accidents. As far as I can understand, we could decrease the necessity of transfers by having multiple routes to the terminals (final stations). 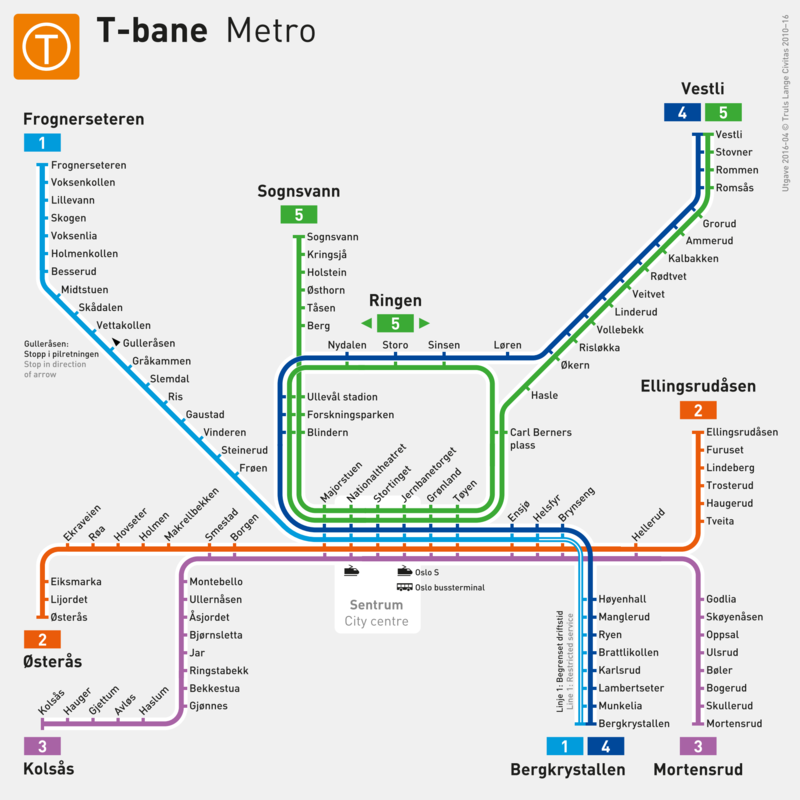 I've reviewed the subway maps of London, New York and Oslo, finding that none of them do this to any significant degree – the terminals usually have just one route leading to them. Imagine that you're travelling from Østerås (orange, left) to Ellingsrudåsen (orange, right). No transfers required – route 2 takes you all the way. But if you're travelling from Østerås to Mortensrud (purple, bottom right), you would have to transfer from route 2 to route 3 at some point. With this design, some transfers could be avoided. If we added enough routes, many more transfers could be avoided. Granted, we would have to wait longer for a route that went exactly to the station we want to go, but we would always have the option of taking the first train and then changing like before. Simplicity for passengers: When only one route serves a particular station, you don't have to think about which route you'll board. Also, the maps are simpler with fewer routes. Simplicity for transport providers: More routes would mean more difficult (and therefore costly) planning and management. From my (admittedly ignorant) perspective, the above reasons don't seem sufficient to outweigh the advantages of fewer transfers. Have I overlooked some problems with adding more routes? Or am I underestimating the costs and/or overestimating the benefits of more routes? Note that I have previously asked this question on Engineering Stack Exchange. I'm asking it again here because I didn't get satisfactory answers, and because I think it's more of an Economics question. and a penalty to reflect the inconvenience, which is calibrated through Stated Preference surveys. So, why aren't the lines designed for switching between tracks? Well, sometimes they are: London's Circle, District and Hammersmith & City lines work very much on this basis: similar rolling stock on the same tracks, connecting different termini. London's Northern line works similarly, with two northern termini, two southern termini, and two branches in the middle, with trains switching between them. At peak times, there is much less switching on the branches on the Northern Line. And the Circle line was recently redesigned so that it is no longer a circle. The reasons for those two things, are the reasons why it isn't done more often. The switching reduces the vehicle-capacity of the network. So it can move fewer passengers per hour. Which adds delays to everyone, at rush hour. Trains are kept a minimum distance apart, in the interests of safety. Where two branches join, as they do at switch-points, that means that trains on both branches have to be kept that distance apart from trains after the switch-point. And the switch-point becomes a bottleneck, reducing the capacity of the two branches: the switch itself has a lower capacity than the sum of the capacity of the two branches. So, during the busiest periods, there is less switching, and that minimises the overall system aggregated generalised cost. And that generalised cost includes the bullet points that I mentioned at the top of this answer. And when new lines are designed, the value of switching routes to different termini usually adds too much of a penalty to network capacity, to make it worth while: overall system utility is typically maximised with dedicated routes. And if you don't want to do switching of vehicles on tracks, then you have to build additional grade-separated tracks to do the switching instead, and that's really really expensive, and isn't justified by the reduced generalised cost that arises from fewer passenger interchanges. The people who do the planning explicitly account for 1) their cost of planning, 2) the cost of wages for transit operators, 3) the cost of infrastructure and 4) the cost of equipment (buses, etc.) ... etc. However, they might not account for the value of time or convenience to transit users. 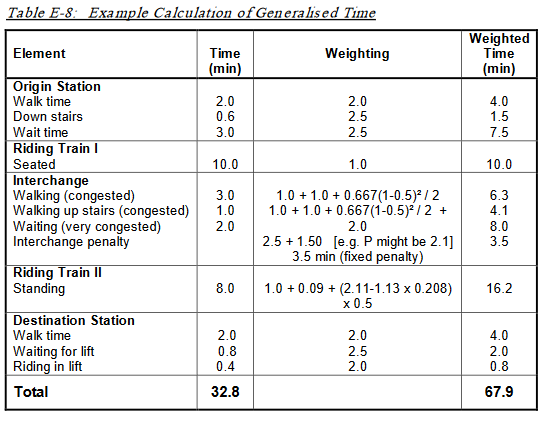 The value of time of transit users may be represented in some manner through the political process, but in the economic modelling it is easier to ignore this than to try to motivate a specific number (or series of numbers weighted across types of transit users) for use in modelling costs and benefits. One way to correct for this is to take surveys to try to find out how people value differences in commute times, although this may face legitimate disagreement about whether maximizing (for example) social welfare or production should be the primary objective in making use of such an estimation. Not the answer you're looking for? Browse other questions tagged microeconomics cost public-economics infrastructure or ask your own question. What is the main cause of differences in the costs of living? What is the formula for how many more I need to sell in order to justify raising cost? How to calculate the average wage increase?